Type location Central African Republic (Messor barbarus L. r. ruginodis n. stirps, Stitz, 1916: 374, illustrated, worker) collected at Fort Crampel, by Schubotz, xi.1910-6.i.1911 (type location given as "Congo" in Bolton, 1995) - no images on Antweb (January 2015) . Stitz's (1916) description is at . Fort Crampel now known as Kaga Bondoro, 6° 58' 60" N 19° 10' 60" E.
Noted by Bolton (1982, not illustrated) as "nomen dubium" as the original specimens appear to have been lost from the Museum in Berlin. He decided from the Stitz description that it is related to Messor capensis (type location South Africa). It obviously is a well defined and distinct species. 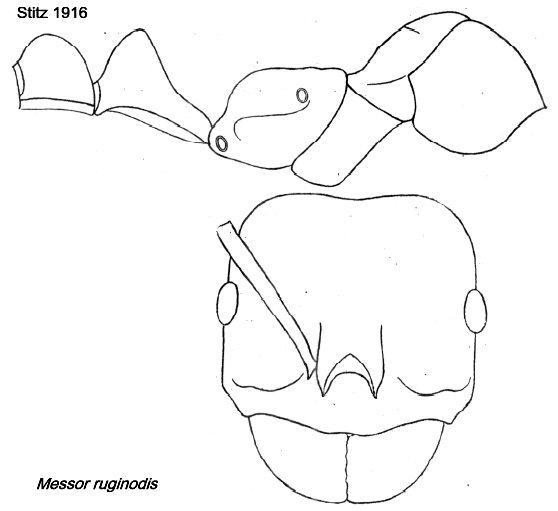 The major worker from Sudan, shown below, is larger, TL ca 13 mm, than the Stitz dimensions TL 9-7 mm, but the head shape shown by Stitz is suggestive of a media worker (see Messor galla morphs from Sudan for comparision of majors). The alitrunk and petiole node are distinctively sculptured, with strong striations, and the petiole has an antero-ventral angular prominence. The hind femora also have several oblique hairs on the ventral surface. Unlike the Collingwood description and fresh specimens from Kenya of Messor ferreri it is not entirely black and the anterior of the head has shorter fine linear striations. It is, however, darker than specimens of Messor angularis collected in Sudan. If my identification is corrrect it clearly differs from M. capensis in not having abundant erect hairs on the gaster. The photomontage is of a major worker from Sudan, Al Gedarf; collector Zuheir Mahmoud. The photomontage is of a minor worker collected as above. The photomontage is of a major worker from Sudan, Dinder National Park; collector Awatif Omer Mahmoud (Sudan 2013 39). The photomontage is of a minor worker from Sudan, Sennar; collector Awatif Omer Mahmoud (Sudan 2013 01).